Known for many extraordinary views of Calgary, Britannia is a popular neighbourhood to Calgarians seeking a unique property. 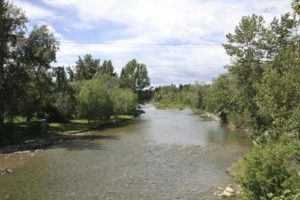 This SW Calgary neighbourhood is located between the Elbow River and Elbow Drive, directly south of downtown. Here are all the current homes for sale in Britannia, and learn more below about this popular community. Britannia is a SW Calgary neighbourhood west of Elbow Drive and north of 50 Avenue South. Britannia real estate features a variety of single-family homes with views of the Elbow River, downtown and towards the west. Riverdale Park is located on Britannia’s western edge. The park overlooks the Elbow River and on clear days can have views of the city and the Rocky Mountains. Visitors regularly go to Riverdale Park to see the special views. 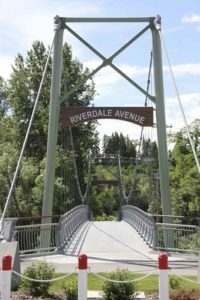 This pedestrian bridge connects Elbow Park with Britannia. Access into Britannia is via Elbow Drive. Commuters can quickly access downtown, in addition to Macleod Trail, which travels north-south. Nearby communities include Elbow Park, Elboya and Windsor Park. Across the Elbow River is the community of Altadore. There are many shopping centres of all sizes along Elbow Drive and Macleod Trail, including the nearby Chinook Centre Mall – Calgary’s largest indoor shopping centre. Right within Britannia is the Britannia Shopping Centre, which has a grocery store and a variety of local shops and services. Pathways for pedestrians, runners and cyclists follow the Elbow River, connecting the Glenmore Reservoir to downtown. Whether for strolls or commuting downtown, Calgary’s pathway system offers year-round recreation. Calgary Transit serves the community with buses that run down Elbow Drive. The 39 Avenue South LRT station is also nearby. Britannia is a great community for dog lovers. The community is home to an off-leash park that has amazing sights, in addition to a local pet food store. The community also has an active community association in Britannia. 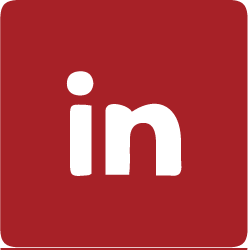 To learn more about homes for sale in Britannia, contact us today!